Print adver­tis­ing is a form of adver­tis­ing that uses phys­i­cal­ly print­ed media to reach con­sumers, busi­ness cus­tomers and prospects. Print ads were once the stan­dard for­mat for cre­ative adver­tis­ing. But as more and more adver­tis­ing dol­lars are allo­cat­ed to dig­i­tal out­lets, print adver­tis­ing is seen as an expen­sive, untrack­able, tra­di­tion­al media for­mat. You would think the cat­e­go­ry is void of inno­v­a­tive ideas, but that’s cer­tain­ly not the case. In fact, many brands are find­ing new ways to merge the dig­i­tal and phys­i­cal world through mag­a­zine and news­pa­per ads. 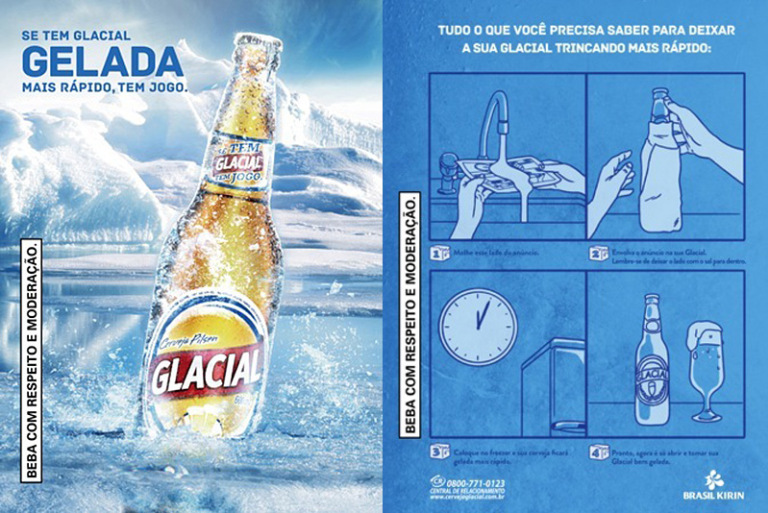 If you’ve ever want­ed to speed up the beer-cool­ing process, you’ll under­stand the allure of this print ad from Glacial. You soak the ad in water, wrap it around the bot­tle, and put it in the freez­er. The print ad was made with salt par­ti­cles, which reduce the freez­ing point of water. This print ad won the Mobile Grand Prix at Cannes in 2014. The ad includes a wrist­band you could attach to your child as he runs around at the beach. The app lets you set a dis­tance and receive alerts if the child wan­dered beyond the lim­it. UTEC, an engi­neer­ing and tech­nol­o­gy uni­ver­si­ty, want­ed to recruit more stu­dents. Instead of plac­ing the smil­ing faces of young grad­u­ates on a bill­board, it cre­at­ed an ad that pulled mois­ture out of the air in Lima, Peru, which sees very lit­tle rain each year. 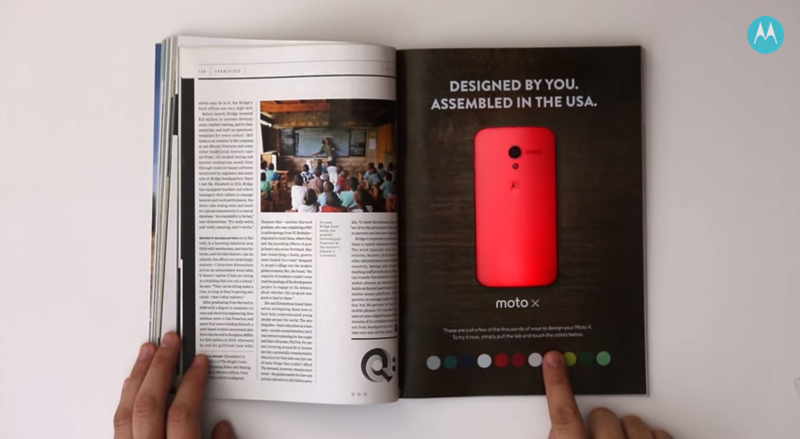 The brand teamed up with Wired to pro­mote the Moto X’s cus­timiza­tion. Peo­ple could change the col­or of the phone by push­ing but­tons. 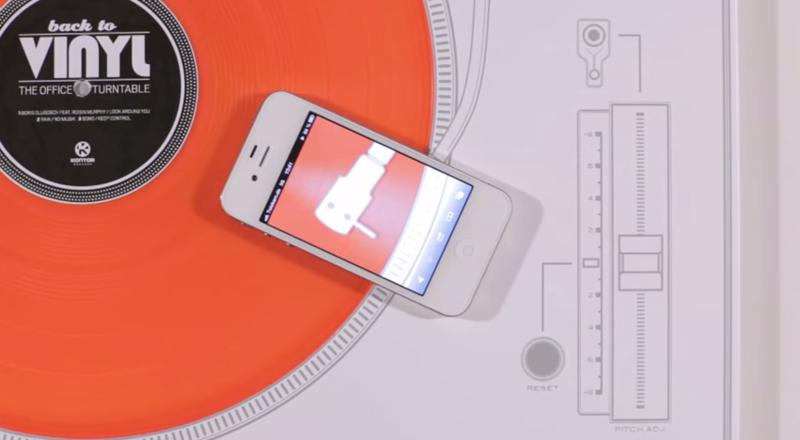 Kon­tor Records want­ed to get the atten­tion of cre­ative adver­tis­ing pro­fes­sion­als. Instead of mail­ing out the lat­est CD, it sent a vinyl record with a paper turntable that could be played with an iPhone. 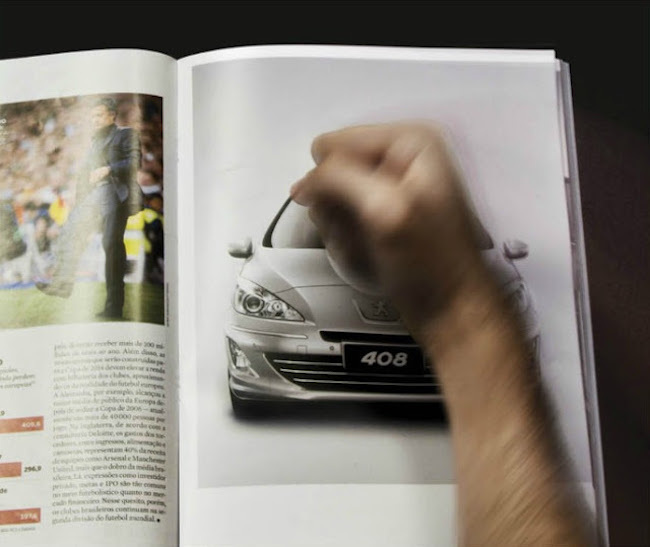 This print ad for the car brand fea­tures a one-page ad with a front view of the car that asked peo­ple to hit the ad. The spread fol­low­ing it includ­ed a mini air bag that inflat­ed when hit. In 2013, Lexus released an ad that, when placed over an iPad, revealed the car in action with dif­fer­ent back­grounds and music. 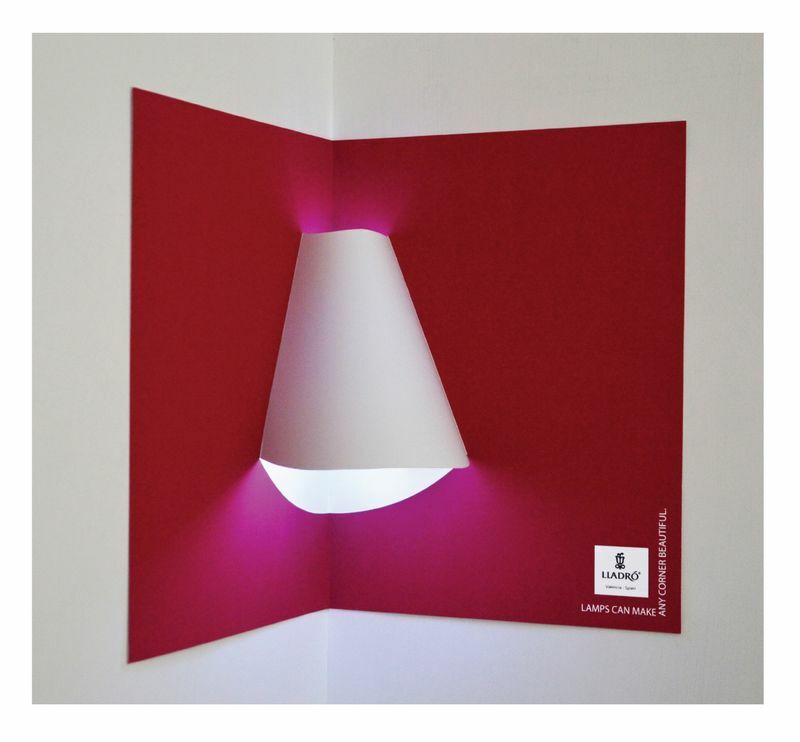 Why adver­tise lamps when you can give peo­ple an ad that trans­forms into a lamp? 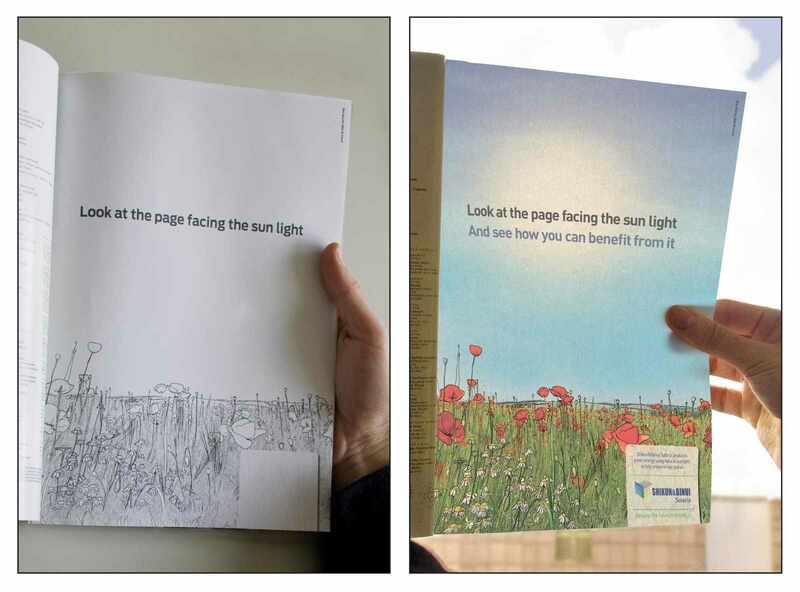 The print ads act like a pop-up book, allow­ing peo­ple to cre­ate their own lamp shape by mount­ing the paper in a cor­ner. To show off the fea­tures of the Ford Explor­er, the brand pub­lished three print ads with inter­ac­tive ele­ments. The read­er could scan a QR code and then line up the phone on the ad to see the car in action. Volk­swag­on pub­lished a three-page spread so read­ers could take a test dri­ve. You could down­load an app and can try out dif­fer­ent fea­tures, includ­ing the “Lane Assist” mode that would cause the phone to vibrate when it got too close to one side of the road. The telecom­mu­ni­ca­tions com­pa­ny high­light­ed its 4G wire­less speed with a print ad that served as the game board for an iPhone game. Fash­ion retail­er C&A pub­lished a print ad in cus­tomized mag­a­zine edi­tions that were linked to a person’s Face­book account. Read­ers could Like their favorite looks on Face­book by press­ing the but­ton in the ad. The data was then sent to a leader­board in the store. 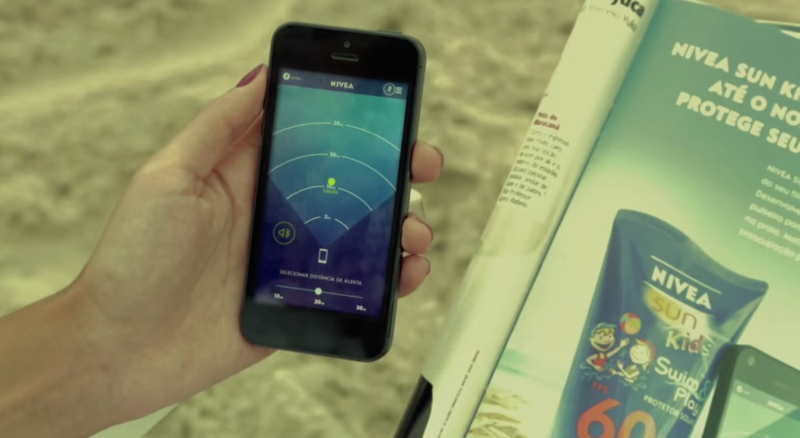 To pro­mote its sun­screen prod­ucts, Nivea cre­at­ed a print ad with a solar pan­el that could charge a cell phone. Israeli ener­gy com­pa­ny launched this print ad to pro­mote green ener­gy. The print ad just seems like a sim­ple black and white draw­ing. How­ev­er, when you hold it up to sun­light, vibrant col­ors appear. 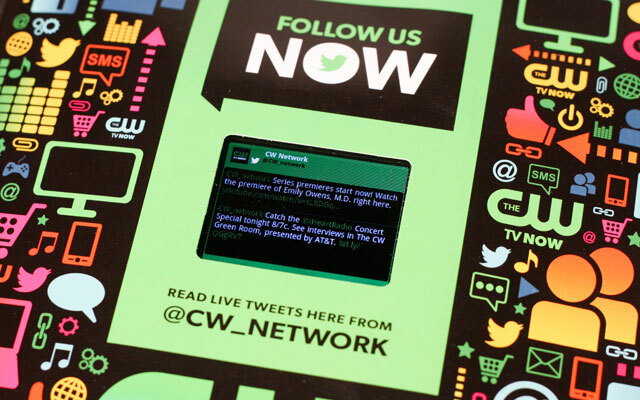 The CW pub­lished this print ad in Enter­tain­ment Week­ly in 2012. The ad fea­tured a LCD screen that is updat­ed with videos from the net­work and a stream of live tweets.